On to Lhasa: The team stopped to visit The Potala Palace, former home of the Dalai Lama, and ancient Jokhang Monastery, two of Tibet’s most important cultural sites. 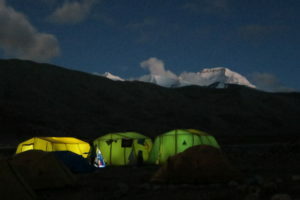 Shigatse-Shegar-Base Camp: En route to Cho Oyu and steadily gaining elevation, the team drove to Shigatse, for an acclimatization hike and stopover. The first couple days of hanging out, resting, and light walking may seem banal, but it’s actually super important. Our expedition has been carefully designed so that climbers have time to safely acclimatizing to high altitudes. Shigatse for example, sits at elevation 12,500’ / 3800m. For reference, talent peaks in Lake Tahoe are shy of 11,000’ /3,320 m. In Shigatse, Topo relayed that everyone was feeling good with the altitude so far. “100%” he reported. “Everybody is fine! Tomorrow will visit the monastery and head to Shegar.” In Shegar, the team visited the Tashilumpo monastery and then hit the road for Base Camp. They stopped for an hour acclimatization hike up the hill across the street and got to almost 15k.